"We developed the Race Carver for very sporty skiers who do not want to compromise speed, edge grip and running stability. Its strengths are fast carving with high running stability and variable carving radii at all times. The strong V-shape introduces the Race Carver into the curve immediately after the edge, and then lets the Race Carver move perfectly to the edge. The Titanal-Carbon-Kevlar construction, developed by us, gives it a very high torsional strength and an extremely rapid rebounding behavior. The “NHS Graphite Race” World Cup tread makes this top ski also extremely slippery, very fast and easy to spin. A true speed machine! The layers of the Radical Race Carver are unique. Note the stacking order of the materials (details on materials and order of sandwich layers provided Mark Farner at Radical). For a ski with two layers of Titanal wrapped in fiberglass, with carbon and kevlar...the Race Carver is remarkably light weight at only 1,350 grams per ski. Radical's Race Carver is a work of precision, superbly assembled and finished. The test pair we reviewed for two days at Chamonix was a demo pair with some usage, but were delivered with a top-shelf base grind pattern and flawless edge tune...all waxed and ready to ride. (This is how they deliver new skis and snowboards to customers). Material mating, fit and finish were excellent. The carbon fiber topsheet showing through the clear coating was super businesslike and handsome. The hand flex was softer than expected, but still in the low-to-medium range, with excellent torsional strength. The light weight of the 165cm pair was surprising, considering its metal layers and carving ski design. The shapely sidecut and squared tail indicated a geometry begging to be set into a carve on firm snow. The overall impression was that this is a specialty ski finely tuned to carve hardpack, but in a lightweight package. Two days of packed powder and hardpack groomers at Chamonix Flegere area - March 2019. The Radical Race Carver is a high-precision technical carving instrument constructed with a rare collection of carbon, Kevlar, fiberglass and Titanal materials delivering a stunningly effectve, stable, high-performance carving behavior while being very light underfoot and easy to ski due to its somewhat soft flex pattern. While many "Race Carvers" from other companies are merely detuned or more shapely versions of high-strung SL race skis, the Radical Race Carver is deliberately designed to be a top-shelf ski for etching arcs into piste by technical carving enthusiasts who don't want the weight, narrow performance bandwidth or intense demand for vigilance of a true race ski. Radical's Race Carver is a prime example of a state-of-the-art European-style carving ski. The quality of the materials and attention to detail of their construction into the Race Carver model demonstrates Swiss ski building craftmanship at its finest. This is a premium product at a premium price, but as with many things, you get what you pay for. The Radical Race Carver eagerly enters a turn with minimal effort, quickly setting itself into a secure bite radius you can modify at will with small adjustments to edge angle and pressure throughout the turn. You can finish the turn with a quick thrust and transition into a new direction with energetic acceleration from the sporty tail, or with a quiet, calm elongation or maintenance of the arc on the center of the chassis until you are ready to reset into a new turn by rolling the skis onto a new edge. No need to over-drive this ski. It can be pressured lightly to get excellent results. The Radical Race Carver feels like a finely honed chef's specialty knife, highly refined and ideally suited to its task without compromise. As with many fine instruments, the Race Carver is remarkably easy to wield, naturally attracted to its job without any need to force it, fight it or manage it. It automatically does its job without intense input from the skier to start, maintain or finish a turn. While feeling light underfoot, the Race Carver is remarkably stable, never darty or nervous. It's prowess is limited to on-piste, since venturing into 3-dimensional snow produces a sinking feeling underfoot (it's only 69mm at the waist), even though the ample shovel can float a bit if you guide it deliberately. The materials in the Race Carver deliver a remarkable combination of intense power handling and energy delivery with secure, quiet, vibration-free, light-feeling personality traits...whichare very difficult to achieve. During testing for two days at Chamonix, we put an advanced intermediate skier onto the Race Carvers, and she immediately became comfortable on the skis, making beautifully executed, confidently carved turns within two minutes. This speaks well to the handling behavior of the Radical Race Carvers since they can be skied by non-experts without intensive learning curves. These are high-quality, high-performance race carvers for afficianados or those looking to ride a top-shelf technical carving ski on-piste. Kudos to Mark Farner and his staff for producing such an excellent example of one of the World's best race carvers. Add a five-year warranty on the flex and camber of the ski, and you have a compelling product. Hardpack and boilerplate surfaces are where the Radical Race Carvers belong. This is their natural habitat. The Race Carvers feel like they have an automatic connection to the surface, like a kid's slot car track, but you never feel locked-in to the point of feeling trapped. You can execute quick, slalom-like turn movements, or longer, GS-like arcs by adjusting the edge angle and pressure. The Race Carvers telegraph the surface density and friction really well without being intrusive, and there is a quiet security underfoot without any hint of nervous darty behavior. They accept a variety of pressure inputs from mild to intense without any resistance or protest. You can ski them gently at low edge angles and pressure levels, or drive them with a vengence to generate some remarkably intense G-forces at high edge angles at low or high speeds. The sheer variety of turn shapes and intensities available with the Radical Race Carver is one of the most impressive characteristics Mark Farner has built into this ski. Many other race carvers can ski intensely, but feel balky or crude at slow speeds. Radical's Race Carver has a very wide range of operational intensity, which is a special quality and hard to find. Stability is excellent at speed on hardpack, with the only hint of nervousness being a very quick response and change of direction if you pounce on the ski more than is necessary at high speeds since it has short radius and (in this case) the ski is 165cm in length. This ski loves hardpack and thrives on it without tiring the skier. We did venture off-piste a few times into relatively shallow, 3-inch new snow, cut-up old snow and windpack, and found the Race Carvers really felt like their midsection sank into the surface and resisted any turn other than a deliberate carve to the left or right in those conditions. Since the Race Carvers excel so well on-piste, venturing off-piste felt like hobbling a race horse, so we immediately returned to the groomed surfaces. The soft-ish flex helps off-piste, but the chassis width and lack of floatation are the real limiting factors in mixed conditions. We did not test in powder, nor would we recommend the Radical Race Carver for powder conditions. The Radical Race Carvers initiate a turn automatically if you tip the ski on edge and mildly pressure it. 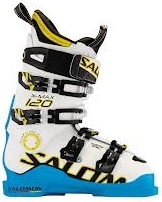 This is a somewhat soft-flexing ski, so once you initiate a carve, the ski pulls itself into the on-edge mode along its entire length, waiting for instructions via pressuring to determine the desired radius. You can hold the desired radius through the apex of the turn, or adjust it by adding or removing pressure or edge angle (or both). Finishing a turn on the Race Carvers is accomplished by either riding the center of the ski smoothly while transitioning edge angle and pressure to a new turn direction, or you can load the tail section and punch it for a jettison movement forward into a new turn. Don't get in the back-seat, or you will find yourself trying to catch up to your feet if you pressure the Race Carvers and don't keep up. This ski rewards a centered, technical stance throughout the turn sequence, and the feedback it delivers during the initiation, apex and finish of its turns helps the pilot feel the surface and determine what levels of pressure and angle will work best for each turn. This is an addicting ski for the technical carving enthusiast. We tested moving the boot position in both directions from the recommended mark, and eventually returned to the factory recommendation for best results. A finely honed chef's knife or surgical instrument specifically designed to perform a specific task really, really well while requiring very little effort from the user. The Radical Race Carver is a World-class example of what a race carve ski can be. Stunningly well designed and constructed with an impressive collection of specific materials in specific layers, but skis very light and easy for a ski with two layers of Titanal...yet flexes easily. Really impressive range of performance intensity from easy to pro-level. Probably one ski that is totally worth the price...no questions asked. Novice skiers will find the Race Carver too precise and overly responsive. Don't be afraid to size this ski like a slalom ski. Don't overpower this ski... there is no need to muscle it. Finesse is the key to operating this ski in its large sweet spot.